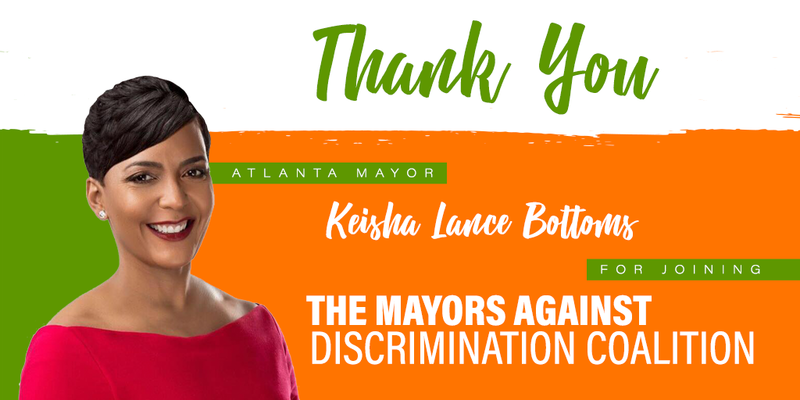 A national coalition working to expand protections for LGBT Americans just got a new member: Atlanta Mayor Keisha Lance Bottoms. This is only one of many steps Mayor Bottoms is taking to make non-discrimination a priority. Earlier this year her office created an LGBTQ Advisory Board to serve as a bridge between the Mayor’s office and residents, and hired the city’s first full-time employee dedicated to addressing LGBT resident’s needs. Mayors Against LGBT Discrimination is a bipartisan group of mayors and other municipal leaders dedicated to securing LGBT-inclusive civil rights protections, utilizing the unique role mayors play in setting policy for their communities. It currently includes 310 members from 48 states and the District of Columbia. In joining the coalition, Mayor Bottoms continues the work of former Atlanta Mayor and coalition member Kasim Reed, and joins Clarkston Mayor Ted Terry, Decatur Mayor Patti Garrett and Pine Lake Mayor Melanie Hammet.